Petiole: 75 to 100 cm. long, brilliant light red occasionally faintly diffused with yellowish-green, indistinctly dark reddish at edge, a dark red ring at base with dark pink for 3 to 5 cm. above. Leaf blade: 35 to 45 cm. long, 25 to 35 cm. wide, 25 to 35 cm. from tip to base of sinus, ovate, dark glossy green with bluish cast; piko conspicuous, purple; veins reddish on lower surface; lobes obtuse, undulate on margins, with narrow sinus. Corm: Flesh white with pinkish tinge, especially near apex, the fibers yellowish; skin pinkish-lilac. Inflorescence: Peduncle light red; spathe 21 to 23 cm. long, the lower tubular portion 3 to 4 cm. long, dark reddish-purple, tightly rolled, the upper portion dark yellow with tinge of red throughout, dark red with dark red streaks at margins, light red inside, partially open near constriction at maturity; spadix about 7 cm. long, the sterile appendage 4 to 5 mm. long, not clearly differentiated from staminate portion. 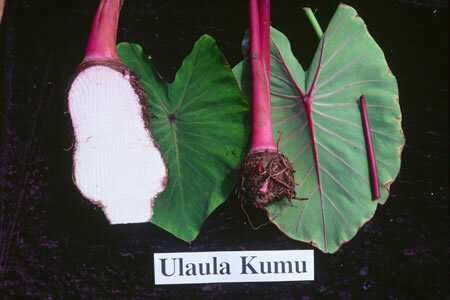 Origin, and derivation of name: Native variety; named after the brilliant red Hawaiian fish, kumu, because of the brilliant reddish color of the petioles. Distribution: Found scattered throughout the islands in small patches under both wetland and upland cultures. Use: Both as poi and as table taro, principally for home consumption; formerly this variety was used as an offering to the gods. Remarks: This is one of the most brilliantly colored of the taros.